Welcome to this episode of the Real Fast Results podcast! Today’s special guest is Rob Kosberg. Not only is Rob a great guy, the kind of guy a person would want to do business with, but he also knows how to make things happen. First of all, he’s a #1 bestselling author and the founder of BestsellerPublishing.org. He’s been featured all over the national media. This includes ABC, CBS, NBC, Fox, and The Wall Street Journal. 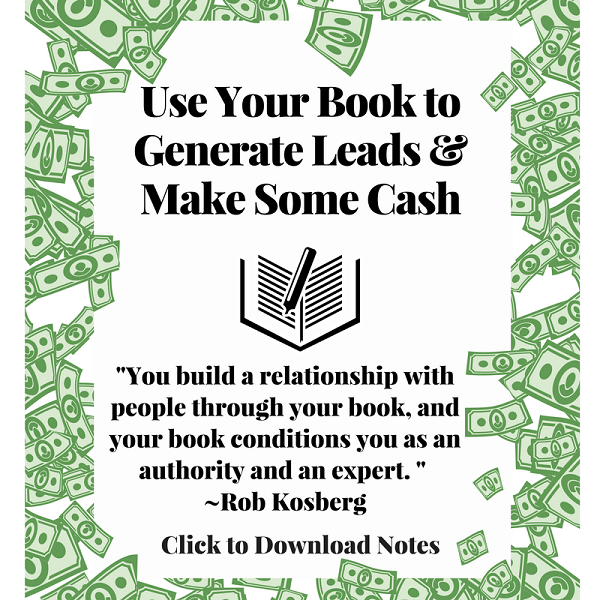 My big promise is that, if you pay attention, I’m going to tell you how you can use your dadgum book to build some leads and make some cash! We want an income and an impact on the world. That’s what we want! I don’t know what the percentages are, but the vast majority of authors that write books don’t make any money from their books. I mean, it’s got to be 97:3, or 99:1, or whatever. The fact that people don’t take action on the things they need to do is actually really good for those of us that do take action, right? If there are some people who are paying attention right now, all you really have to do is execute on the stuff that we’re talking about, and that we’re going to talk about. The truth of the matter is that because of your book a number of people will see you as an authority. Click To Tweet They’ll be interested in booking you with the major media, and they will want to buy your stuff. That’s because they need help in whatever way that you can help them. Look, people not taking action is always the problem. If they would just do it, they’d be successful. What is it that’s really driving you to succeed? With traditional publishing the book is the end of the story. For me, and for my clients, the book is the beginning of the story. You know, I’d say the best way is just on a website. It’s BestsellerPublishing.org. We have a ton of free content on there. Obviously, people can look at our various case studies and fill out an application, if they wish to, and talk to our team. We are all in Pasadena, CA. The team consists of 16 people, and it includes writers, PR publicists, and all of that stuff. We’re happy to help in any way that we can.